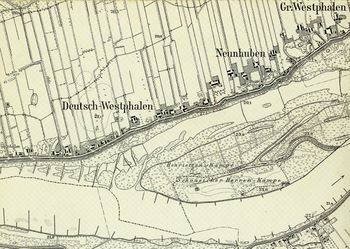 Detailed map of Neunhuben, Deutsch-Westphalen, and Gross (Polnisch) Westphalen. Source: Archiwum Map Zachodniej Polski. Neunhuben (also known as Dziewięćwłók, Bahrenhof; now known as Dziewięć Włók); coordinates: 53.44585, 18.66143 [53° 26' 45" N, 18° 39' 41" E]; population in 1905, 99), is located 8.1 kilometers (km) (5.1 miles) west south-west of Grudziądz (Graudenz), 14.4 km (8.9 miles) east north-east of Świecie (Schwetz), 18.5 km (11.5 miles) north-east of Chełmno (Culm), and 26.4 km (16.4 miles) north-west of Wąbrzeźno (Briesen). It is situated along the north-west shore of the Vistula River west of Polskie Stwolno (Gross Westphalen) and east of Wielkie Stwolno (Deutsch-Westphalen). In 2014 it was a village in the administrative district of Gmina Dragacz, within Świecie County, Kuyavian-Pomeranian Voivodeship, in north-central Poland. Neunhuben was in 1659 ff. settled by Dutch colonists who may have been Mennonites. In the course of time they all left this area on account of repeated floods. Then in 1745 the village was bought by a number of Mennonite farmers from the neighboring villages of Montau, Schönsee, and others. In the land leases of Neunhuben the following Mennonite names are found: Kopper, Rosenfeldt, Goerz, Klieuwer, Bartel, and Geddert. The census of 1776 lists six Mennonite families in Neunhuben, with the following surnames: Bartel, Gedert, Goertz, Kliewer, and Nachtigal. In 1824 seven Mennonite families lived in Neunhuben, with the following surnames: Bartel, Becher, Ewert, Geddert, Goerz, and Harms. The Mennonites of Neunhuben belonged to the Montau congregation. "Familienforschung in Westpreußen." Hans-Jürgen Wolf. Web. 29 September 2012. http://www.westpreussen.de/cms/ct/ortsverzeichnis/details.php?ID=4705. Hege, Christian and Christian Neff. Mennonitisches Lexikon, 4 vols. Frankfurt & Weierhof: Hege; Karlsruhe: Schneider, 1913-1967: v. III, 219. Wiebe, H. Das Siedlungswerk der niederländischen Mennoniten im Weichseltal. Marburg a.d. Lahn, 1952: 25 f, 59 note 23, 100-104. Zijpp, Nanne van der and Richard D. Thiessen. "Neunhuben (Kuyavian-Pomeranian Voivodeship, Poland)." Global Anabaptist Mennonite Encyclopedia Online. September 2012. Web. 22 Apr 2019. http://gameo.org/index.php?title=Neunhuben_(Kuyavian-Pomeranian_Voivodeship,_Poland)&oldid=145937. Zijpp, Nanne van der and Richard D. Thiessen. (September 2012). Neunhuben (Kuyavian-Pomeranian Voivodeship, Poland). Global Anabaptist Mennonite Encyclopedia Online. Retrieved 22 April 2019, from http://gameo.org/index.php?title=Neunhuben_(Kuyavian-Pomeranian_Voivodeship,_Poland)&oldid=145937. Adapted by permission of Herald Press, Harrisonburg, Virginia, from Mennonite Encyclopedia, Vol. 3, p. 856. All rights reserved. This page was last modified on 16 January 2017, at 00:54.